Not so much a museum, as a working office, a home and a court of justice. 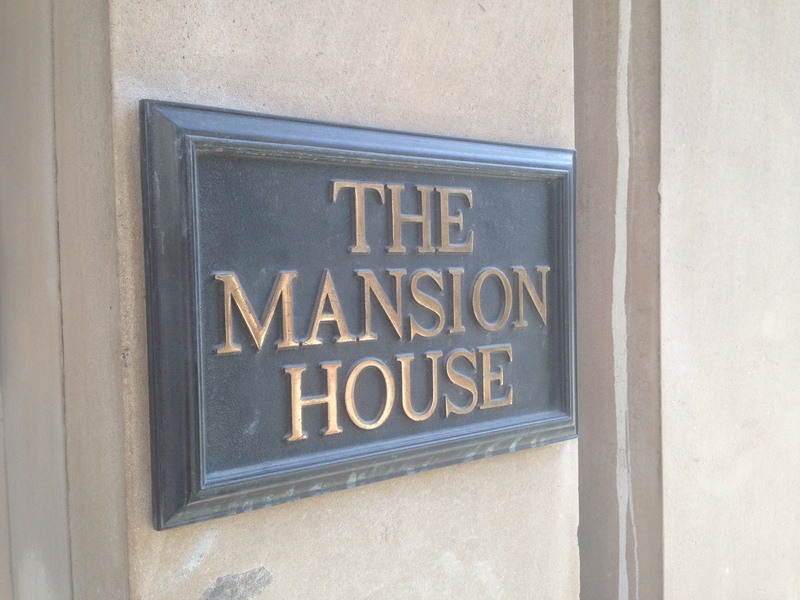 Mansion House is the residence of the Lord Mayor of the City of London. The Mayor acts as a diplomat for the city – promoting its businesses and helping to improve the welfare of its residents. It may sound like quite a nice life – but we were informed it’s a busy one. The Mayor regularly has over 12 engagements a day, and almost every meal is a working one – a working breakfast followed by a working lunch followed by a working dinner. She never gets to just kick back, put on a film and eat cheese. How sad. In the entrance hall sits an original porter’s chair – it’s beautiful, almost regal. 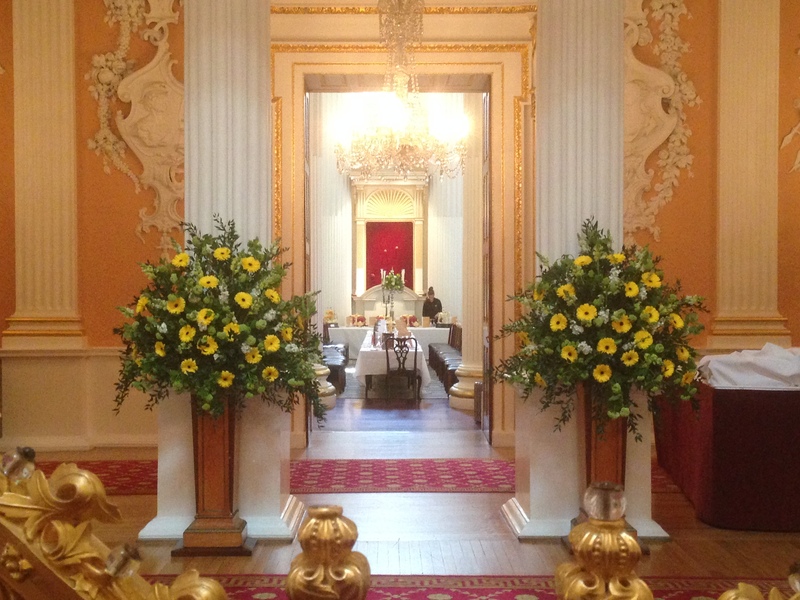 We were lucky enough to visit on the day of the Mayor’s Easter Banquet. 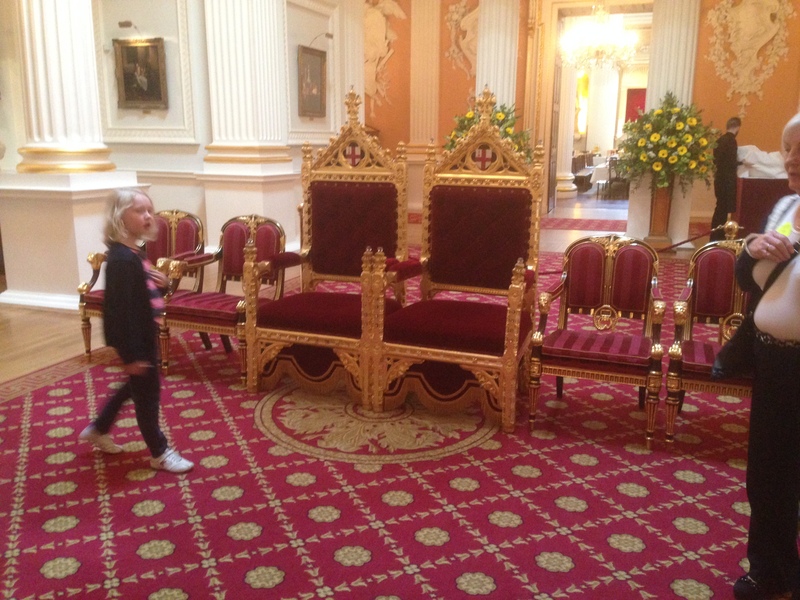 The thrones were laid out for the greeting ceremony. 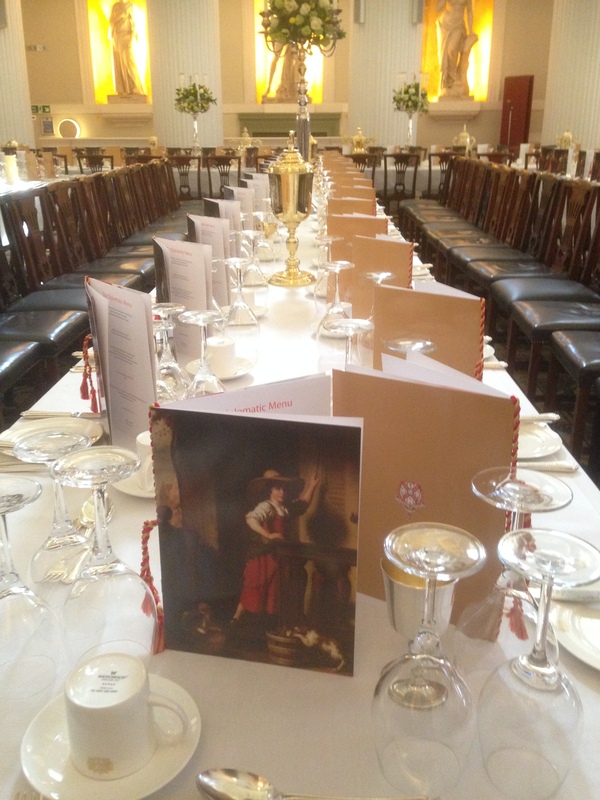 Later that evening, the Lord Mayor, the Mayor’s two sheriffs, and all of their partners would have sat here and greeted the banquet guests. Quite a daunting affair. In the Egyptian Hall, the staff were busy preparing the tables for the banquet. On the table, you can see the Guild’s Loving Cups. The Ceremony of the Loving Cup is said to go back to Saxon times, before the Norman conquest of 1066. The ceremony is fairly complicated, and involves ‘drinking to your neighbour’, who ensures you aren’t stabbed in the back (literally) whilst drinking. 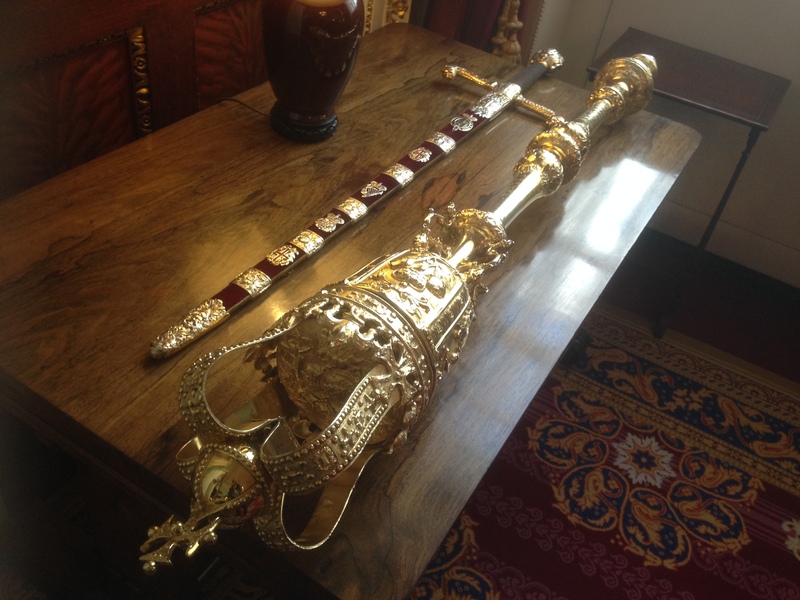 We also got to see the Mayor’s Mace and Sword up close – which was pretty awesome. 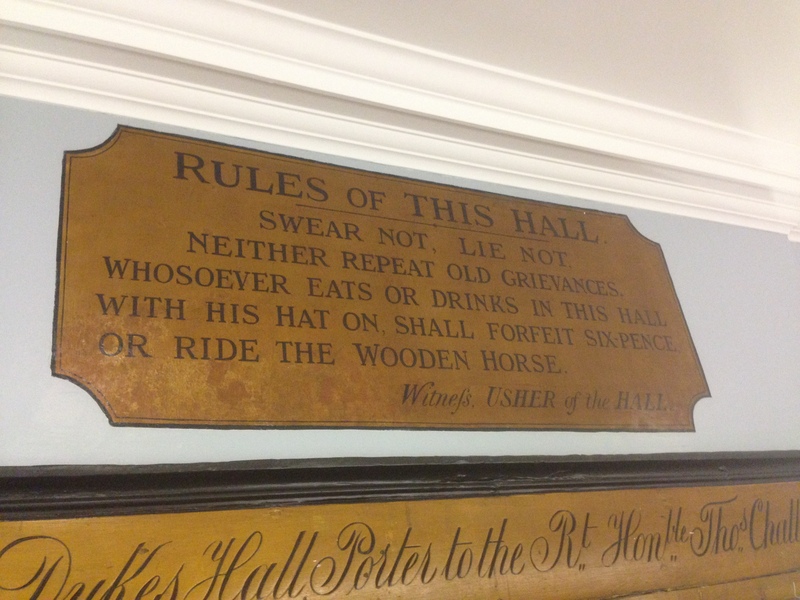 But perhaps the best thing was the gents – look how great that sign is! #1. 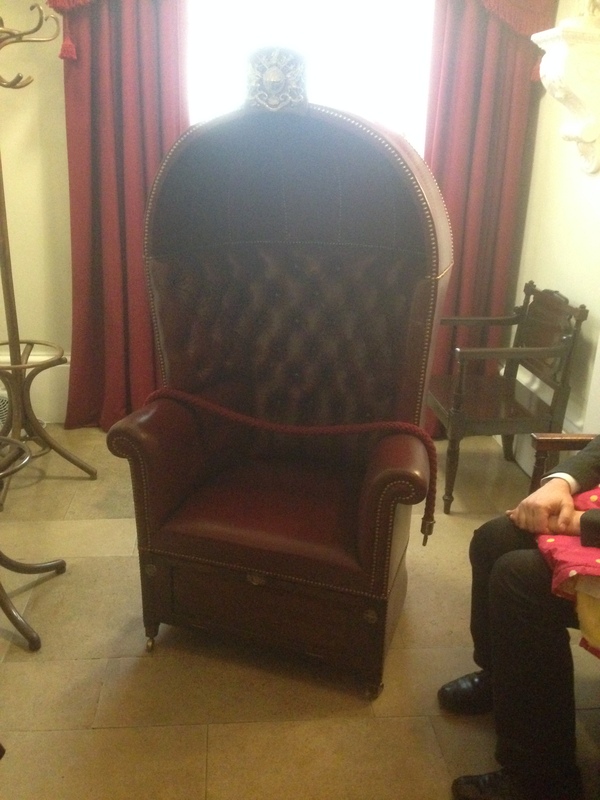 The porter’s chair in the entrance hall has a drawer below the seat. In the past the drawer held hot coals to warm the porter’s bottom. #2. The Queen walked through the same entrance that we did at her Diamond Jubilee a few years ago. #3. The chandeliers are the weight of nearly 3 average men. #4. The house is closed for the entire month of August and over 300 litres of paint are used in its renovation. #5. In one of the stained glass windows, you can see the scene of the Peasant Revolt, in which the leader Tyler is stabbed by the Lord Mayor, who believed he was planning to kill the King.